July 1, 2018 (less than 5 weeks from now), sees the introduction of Single Touch Payroll in Australia for companies with 20 or more employees. Ultimately STP is about the ATO having timely access to data on paid employees. Typically the ATO has only been getting information on employees pays, post financial year end. STP moves data collection to near “real-time” with data collected on or before each pay day. The ATO has acknowledged this data WILL be shared with other government agencies. As of December 2017, the Department of Home Affairs has been collecting Tax File Numbers for cross matching data with the ATO. With the introduction of Single Touch Payroll, they will now have “near real-time” access to who is working (being paid), which can then be cross-matched to visa entitlements and restrictions. The ATO has specifically highlighted Home Affairs as a key department they are working with under the Data-Matching Program. Lax work rights oversight and ignorance of the Migration Amendment (Reform of Employer Sanctions) Act 2013, will now be a very risky proposition. No longer are Border Force or Fairwork inspectors needing to audit your payroll system to audit employee work rights. STP offers them an automated, en masse audit process. Is it time to revisit vSure? vSure is your automated, works rights validation and monitoring solution. Helping protect your organisation and its directors and officers from fines of up to $94,000 per breach! Our InstantCheck solution is a fast, efficient and effective way to keep on top of your employee work rights click here to access. The vSure app can make checking work rights at on-boarding, fast and easy, as well as automate ongoing monitoring click here to request a demo. 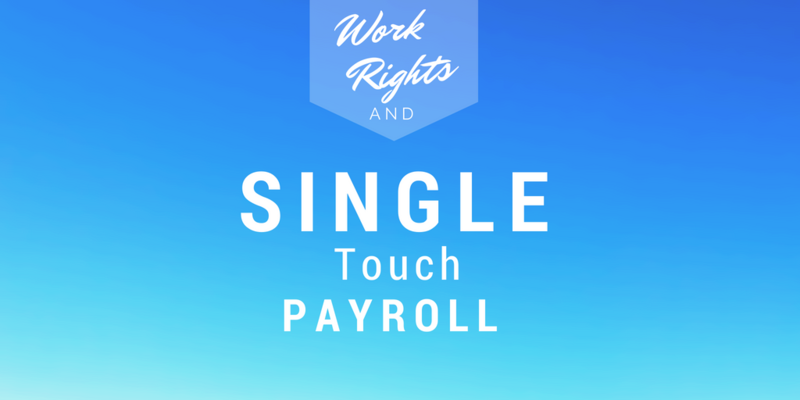 One response on "Single Touch Payroll & Employee Work Rights"